Steve Fisher's Karate school offers the finest training facilities available in the South Bay area. The club is clean, well lit, air conditioned and offers dressing rooms for men and woman from ages 6 - 60. Weight training, heavy and light punching bags, stretching equipment, close supervision in all classes and mirrored walls are some of the outstanding features of the school. Evening classes meet 5 days a week. Private lessons are available upon request. 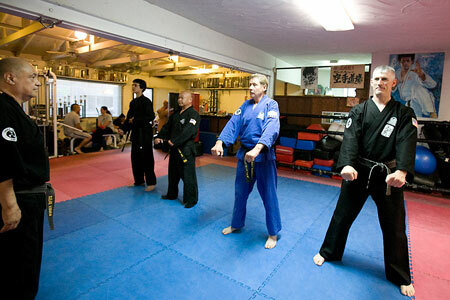 Special self defense classes, as well as children's classes, are just some of the extra activities offered by the club.